We are so fortunate not only to live surrounded by farmers producing fantastic meat, vegetables, soft fruit and dairy products, but our location in Angus ensures we are also surrounded by fishermen, with delicious fresh fish on our doorstep. 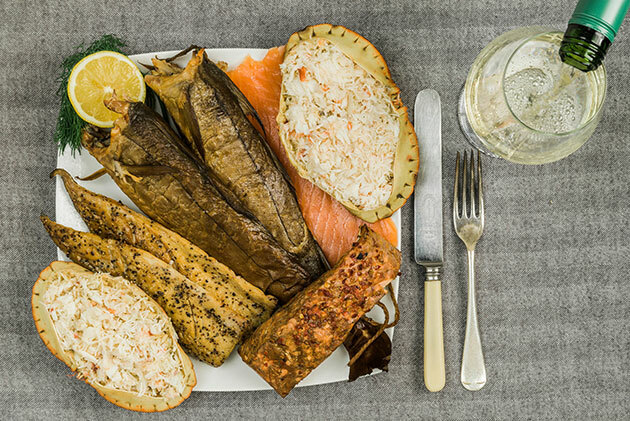 This selection contains a mouthwatering selection of freshly caught fish from the nearby fishing Port of Arbroath, home of the world famous "Arbroath Smokie." Arbroath Smokies are a must-try food experience while staying in Angus. Fresh local haddock is smoked traditionally over hot coals. Our "fishman" delivers this selection to the farm for our guests to enjoy.